"The scientists intend to use the massive soon-to-be-built telescope at the Altay Optical-Laser Center and convert it into a laser cannon," a source from Roscosmos told Sputnik News. On June 11, researchers at the Scientific and Industrial Corporation "Precision Instrument Systems" (NPK SPP), a group within the Russian space agency Roscosmos, announced the creation of a laser cannon that will shoot down space debris that is currently orbiting the Earth. How is this supposed to work? Would shooting things in orbit not simply break them into smaller (less easily trackable) things which are still in orbit? The cannon will follow a process known as "laser ablation" to shoot down space debris. Energy from the cannon will heat space junk with a beam, which will then vaporize it. As a result, the space junk will evaporate. But surely that will just create lots more < 1cm particles to worry about? The ablating material imparts a small thrust that lowers its orbital perigee into the upper atmosphere, thereby increasing drag so that its remaining orbital life is short. Other funded research into this area refutes NASA's claim and demonstrates the precise physics involved, which shows that space debris is re-entered regardless of the direction of laser illumination. But I'm still not sure I'm convinced. I think I get how pushing an object "up" would cause the other side of its orbit to lower, but if the object were tumbling (or was induced into a tumble due to being shot with a laser), wouldn't the direction of the ablative thrust end up going off in random directions? Also, how small must the bits of ablated matter providing the thrust be to avoid becoming a problem themselves? 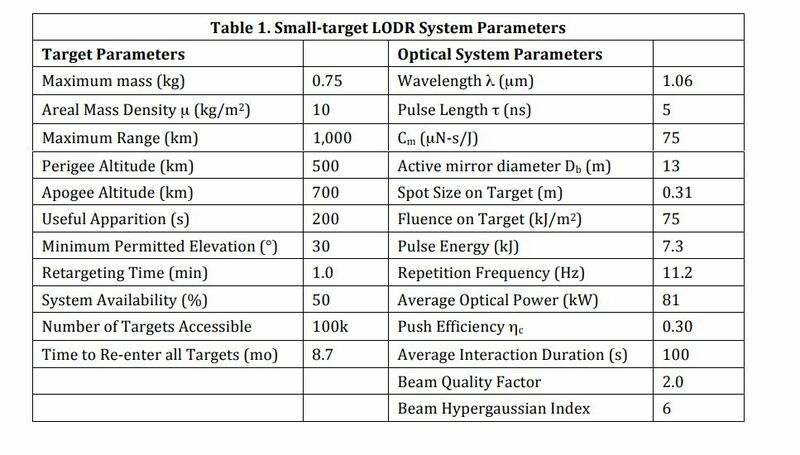 Here is a pdf studying techniques of laser debris removal. 1) Non-ablation laser debris removal (by light pressure and termal radiation) is ineffective. Only impulse laser ablation is feasible. 2) Large mirror is required (11-13 meters) to focus laser beam. 3) 0.75 kg aluminium piece of junk at 500 km orbit requires 9 months to be deorbited (with laser illumination 100 seconds per orbit). Laser pulse energy 7.3 kJ, repetition frequency 11 Hz. Evaporation turns things into a gas, so the particles will be individual molecules, which don't pose a problem. The tricky part is getting the space junk to evaporate and not disintegrate into small but dangerous pieces. This requires slow, gradual heating, instead of blasting it with a lot of energy all at once. Slow heating requires time, so you have to keep the laser on the target for a while. This is more difficult than hitting it just once with a brief pulse. The ablation or gradual over time vaporization of bits of space stuff would fill Earth orbit with metal vapors and other things but at the temperatures of vaporized metals, the atoms will have so much energy (as the temperature of a gas is the speed of the atoms or molecules) that they will most likely escape and be swept away by the solar wind or enter the atmosphere. But how do you put that kind of energy on a bit of stuff in orbit, and through the turbulent atmosphere? I am not positive how it is done in this project, but back during Ronald Reagan's SDI, there was a secret project to use space based lasers to destroy ICBMs in flight. Many eminent experts said it could not be done but they did not know about the special laser invention. A Phase Conjugate Mirror is a gas laser that can be pumped to high energy and then be triggered by a weak pulse of laser light. If you fire a targeting laser, any light reflected back from the target passes though the atmosphere and the wavefront is distorted beyond use. That is, unless the pulse enters a phase conjugate mirror. The mirror lases and produces a very high power pulse with a wavefront that is the exact inverse of the incoming targeting pulse! The result is that not only can you get the maximum power on the target, but you cannot miss! Today computers and actuators are fast enough that they might use deformable optics to compensate using data from a targeting laser. Personally I would like to see a big conjugate mirror in operation. Not the answer you're looking for? Browse other questions tagged orbital-mechanics debris laser or ask your own question. Who is the artist of this image appearing in an article about a Russian space laser? Could upper stages take down space debris as a 2nd mission? Has any (additional) debris from Mir de-orbiting been found? Did the “Zvezda” module really dock to the ISS 2 weeks after launch?